Initial capacity: 125 employees. Upgradeable to 250 employees. 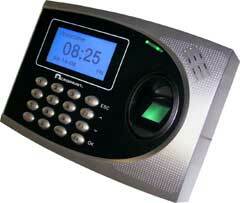 Includes: Terminal, locking mounting plate, users guide, software, easy-starte manual, cables. Includes new Job Costing software. Includes new easier clock installation/setup module, for network connections. - collect the punches, carry back to the office, then import them! Display can be set to run in English, Spanish, or French. Multi-user, network enabled software upgrade (see above list). Run on one PC - or from up to 5, with the optional software upgrade. Large, bright back lit LCD display. Built-in memory stores up to 50,000 transactions. Automatically updates your punch records at prescheduled (by you) times. Restores to current time and date, and remembers punches after power outages. Swipe-and Go settings at the terminal - simply waive the badge and walk away. * Select the pay cycle: Weekly, bi-weekly, semi-monthly, or monthly. automatically become an IN punch. Ex: Hire Date of 2/1/2010 - +90 days to qualify. Thanksgiving, 12/25 Christmas, 1/1 New Years. * Salaried employee minimum hour requirement setting to get paid. --- does much of the work for you. and OUT on another - requires 2 or more terminals to do this. Payperiods: Weekly, Bi-Weekly, Semi-Monthly and Monthly. Overtime: Two classes: Daily and weekly, plus 7th day OT. Automatically adjusts for daylight savings, leap years, month changes. Records sick time, vacation, holidays, and other absences..
Automatic IN Punches: You set the length of time from the IN punch. --- in the software. This is a very useful feature.